It’s been awhile since my last post, so I thought I would share some interesting information. The first graph illustrates the historical supply and new listings on a seasonally adjusted basis. Sales and new listings have been adjusted on a seasonally adjusted basis so that it gives a leading edge indicator of of how the resale market is performing. For example, December is typically the worst month of the year for sales and May is the best and there is a fairly consistent seasonal pattern to resale volumes. This adjustment also allows one to determine whether price movements are caused to to changes in supply or changes in demand. In the past few years, sales volumes I believe soared well above demographic demand, and in early 2009 were well below demographic demand. I believe future sales volumes will fall moderately from here due to what has been described as demand driven overbuilding (premature buying) that occurred in 2006. Looking at new listings, one can see that supply is not the problem that many blogs had predicted would happen due to high foreclosures. Supply is much lower than it was in 2007 and 2008 and this is I believe because a much lower percentage of loans was granted to debtors of poor credit quality as compared to the US. I think there is also a rational component to the ebb and flow of activity in the resale market. The series of events that occurred over the last few years may be as follows…. In 2005\2006 as rental vacancy dropped to 1%, and perceived slowness to bring new product to market, buyers reduced their personal time horizon to buy. This is driven by a belief that if they do not buy now, then they risk further price appreciation occurring or waiting a long time for house prices to drop. Potential sellers also recognize that there is a lack of supply, and put off selling. Speculators also enter the market to drive up demand in the short term, but do not immediately cause an increase in supply. In mid 2007, when inventory is increasing, and new construction was high, it is apparent that supply can satiate demand at that price point. Potential sellers and speculators that were delaying selling rush to the exits to cashout. Also, buyers suddenly realize that there will be a price correction, and now instead of reducing time horizon to buy, they increase the time horizon to buy as they realize that in the near term there was going to be a price correction. This causes a very sharp and sudden shift in both the supply and demand balance. 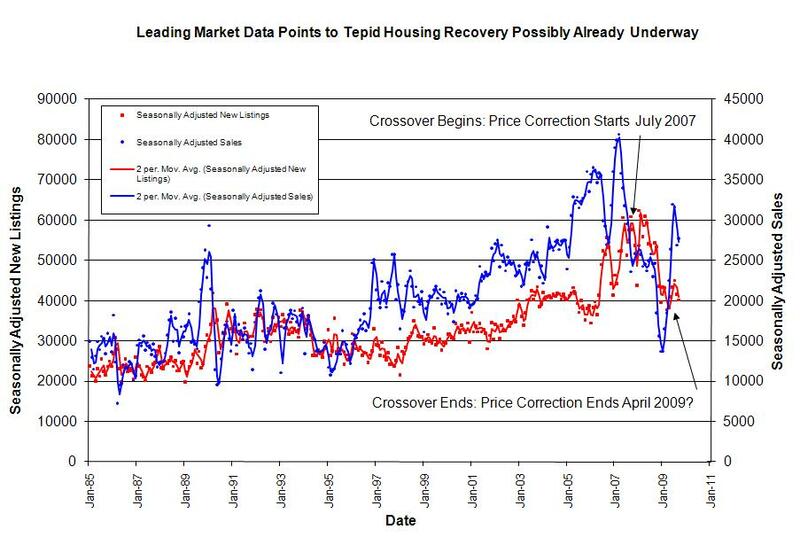 In 2009, when housing construction nearly ground to a halt (especially with MFH starts) buyers have now begun reentering the market once again as inventory depletes. Potential sellers may also now be once again delaying selling purchases due to perception that the market has turned the corner, and less risk from a wave of supply coming from foreclosures. In summary, I believe the price correction in the resale market is over for now as indicated by the graphs below… Although, I do not see why a relapse into a bear market is not possible if sales were to drop again. Housing corrections typically occur over a period of several years, and historically taken at least 4 years to unwind so I would not be surprised to see further price drops if the supply\demand situation shifts once again. There are reports that the Calgary commercial office space is overbuilt and vacancies will rise to 20% in the coming years and will halt commercial construction in Calgary for several years. The good news is this will provide stability and growth opportunity for businesses in Calgary as they can better keep a lid on operating costs. Posted by DustinRJay in Calgary real estate, supply and demand. There are really three separate, but linked, real estate markets: the resale market, the new construction market and the rental market. 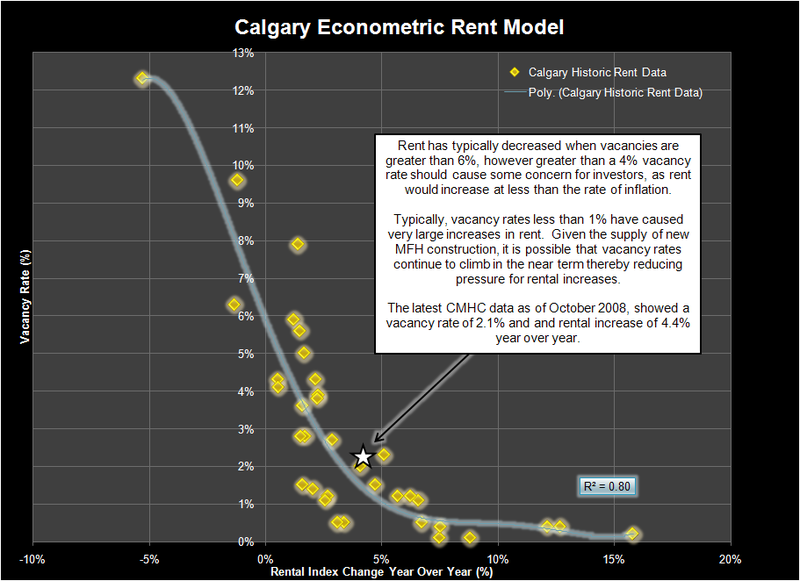 The following graph shows the historic relationship (1973-2008) between vacancy rates and rental increases for Calgary and has a good correlation of R²=0.80. In 2005 and 2006 supply was much less than demand and house prices rose. 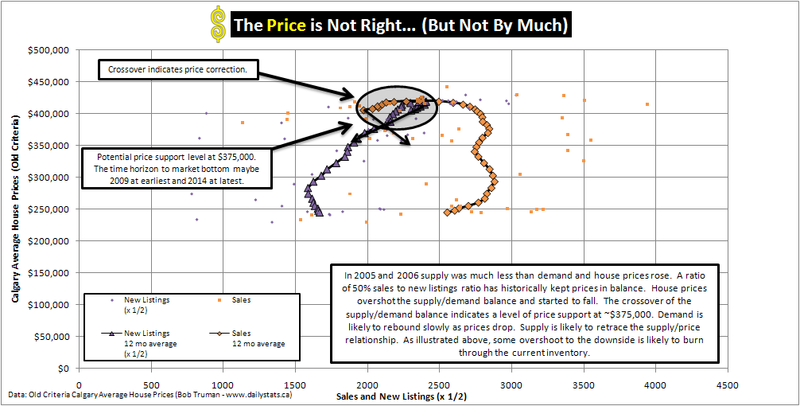 A ratio of 50% sales to new listings ratio has historically kept prices in balance. 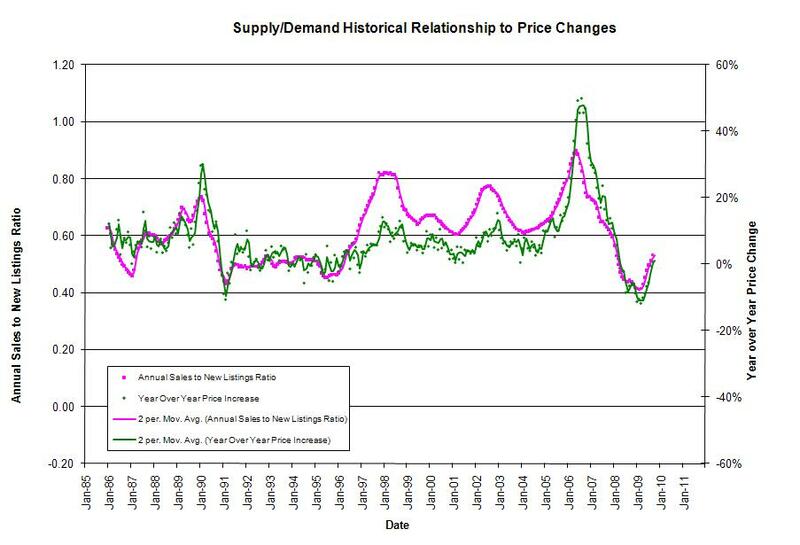 House prices overshot the supply/demand balance and started to fall. The crossover of the supply/demand balance indicates a level of price support at ~$375,000. Demand is likely to rebound slowly as prices drop. Supply is likely to retrace the supply/price relationship. As illustrated below, some overshoot to the downside is likely to burn through the current inventory. A split has occurred in regards to the single family home and multi family home construction environment. The following article address the differences in supply-side characteristics for each market. The supply of residential construction in Calgary has been tightly correlated with house prices over the past 30+ years. High house prices lead to high levels of residential construction as increased margins encourage more market participants. 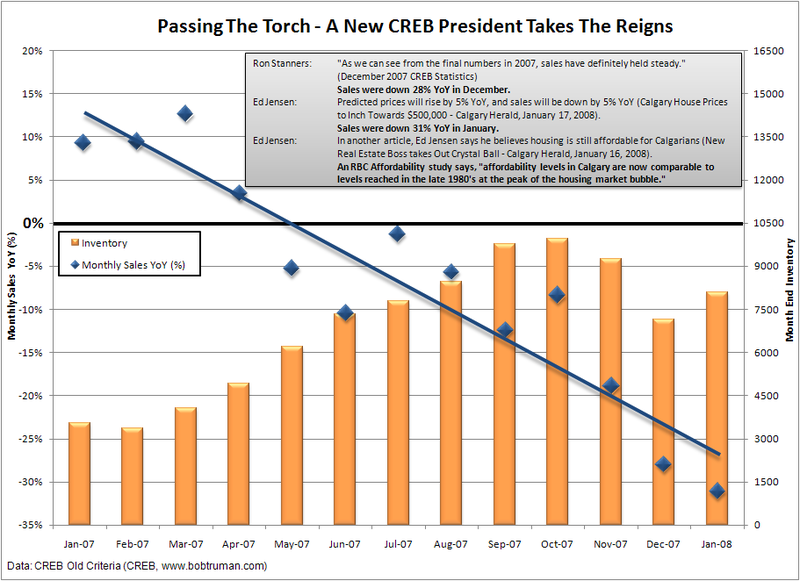 I believe this graph demonstrates that the Calgary real estate market is capable of oversupplying the market at the current price point and will continue to do so until developers margins are thinner. Feel free to post your own interpretation below. 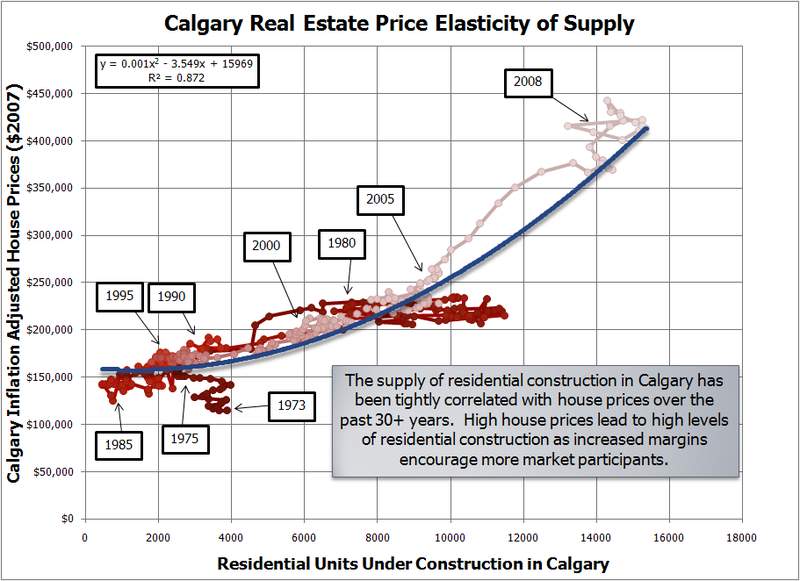 Posted by DustinRJay in Calgary real estate, condos, supply and demand. There are massive levels of new construction about to hit the condo market. There are a record 3,000+ condo units for sale in the resale market. This is relatively small in comparison to the whopping 20,000+ multi-family residential units that are in construction, approved or proposed for Calgary. 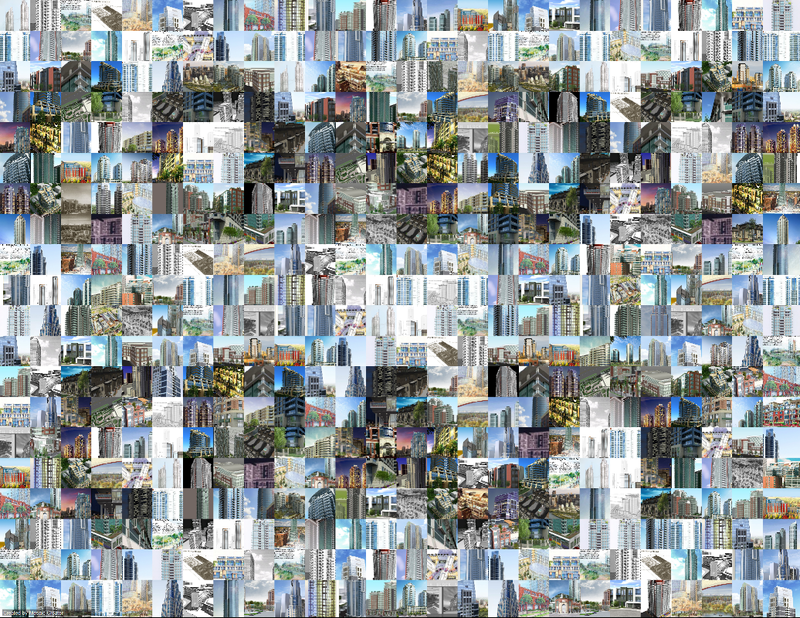 The following mosaic and slideshow was compiled based on condo construction due for Calgary. Hat tip to Boris2K7 for providing detailed information on the Calgary Construction Forum. 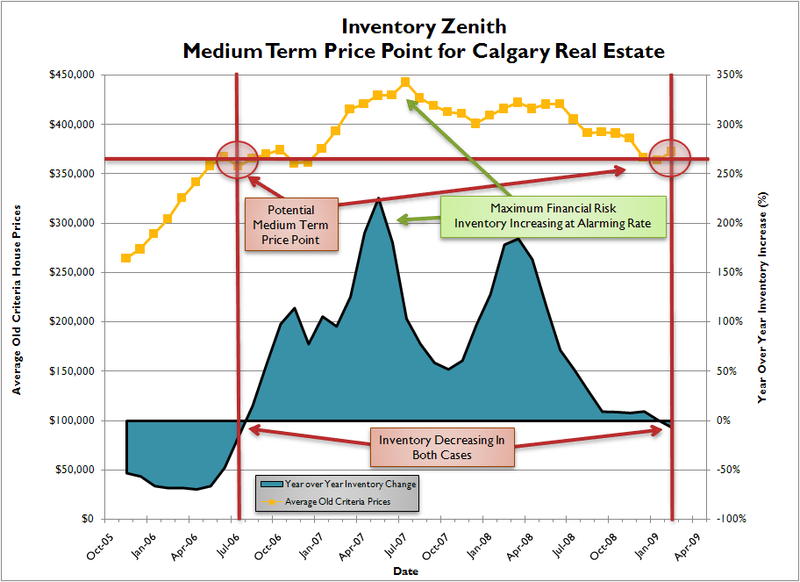 Posted by DustinRJay in Calgary real estate, mortgages, risk spreads, supply and demand. When house prices are increasing, if a homeowner’s mortgage is delinquent they have the option to sell and preserve their credit rating. However, in a falling real estate market, the homeowner will often end up foreclosing due to lack of an option. Therefore credit risk typically only appears when house prices are falling. Credit has become easier in Canada over the past few years and that has affected the supply/demand balance. The following three posts will cover some aspects of how the credit markets are changing and how risk to the mortgage markets only appears after house prices have started falling. 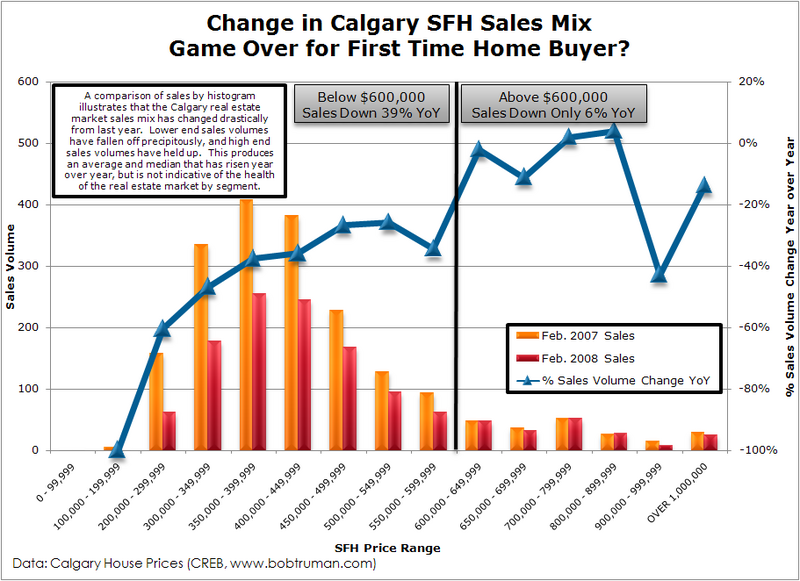 Single family home sales have dropped off dramatically in Calgary year over year. Therefore, it’s difficult to determine if averages and medians are representative of the direction of the market or reflective of changes in composition of the sales mix. As an aside, things in naturally occurring populations typically lie in a log normal distribution (including distribution of reserves in oilfields). Hence, it comes as no suprise that things like household income and also house prices also lie in a log normal distribution.